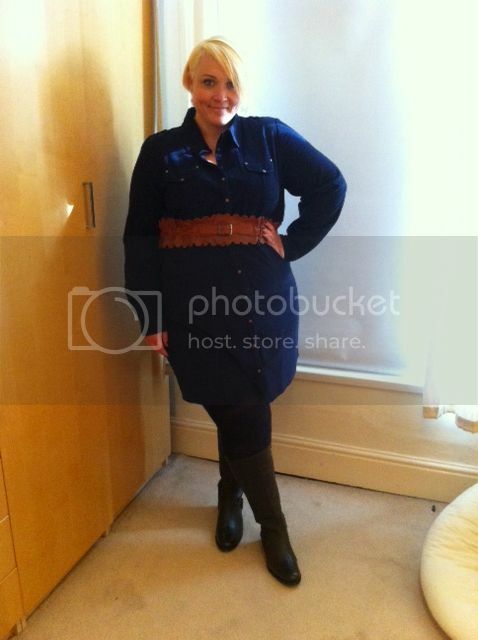 The lovely guys over at Curvissa sent me this cord shirt dress to try out, as you can see from the pics I wore a couple of weeks ago when I still had the whole blonde thing going on! As always with Curvissa, I found it useful to size up, I went for the 24 to ensure it would fit my hips. My only problem with ts dress is that the combination of press stud fastening and no stretch in the material meant every time I sat down they popped open and my very lucky husband got an eyeful of my, well, everything.... Which is of course not great, if you really love this dress I'd advise sewing down the central seem and putting on over your head, which is what I will be doing. Overall I liked this dress, I'm enjoying adding more casual dresses to my wardrobe after spending the past few post pregnancy years in leggings for sheer ease! The popper issue is a bit of an annoyance, but luckily I have a mum who's quite handy with a sewing machine! Stunning dress. Looks super brill on and super coomfy! Brilliant suggestion about whizzing down the middle with the sewing machine. Had to do that with a jersey dress that had buttons which were just that little bit too small and kept 'slipping' out of the holes! JUST A BIT IN LOVE!!! Lovely! and I really like the belt you used with it.